human. 🙂 But while the game we’re going to talk about here was first announced in June, I’m happy to see the number of new games we are starting to hear about as developers build up to the big arcade shows next month. Incredible Technologies has a brand new IP on the slate and from the looks of it, the game will probably be out by the end of September. 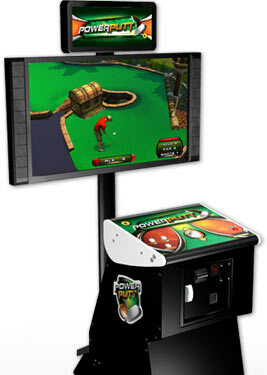 Called Power Putt Golf, this brings miniature golf to the arcade, IT style. Thanks to a teaser site of the game, here is a rundown of the details. First, PPG has 3 courses to play on: The Freaky Tiki, Dusty Trail, & Skull Island, each with 18 holes. PPG allows for up to 8 people to play either casually or in an organized league and up to 16 people can play in the Tournament Mode (which probably means that you should expect to see plenty of tournaments held for PPG, much like Golden Tee or Silver Strike Bowling). The game has leaderboards and will reward a player for making special shots and to top it all off it will include the new Hit List feature where players can “discover new music while they play”. It looks like a fun game and it has some sharp graphics along with an eye-catching cabinet to boot. Expect to hear more on this one soon and it has just been added to our Master Arcade Release List for 2008.